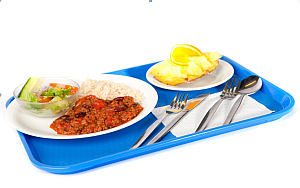 For many years a manual system in paper format has been used to record and monitor the dinner money income for primary and special schools, 2 forms are used and returned from each school on a monthly basis, and depending on the set-up in the school 2/3 people are involved to collate the information. The value of income from primary and special schools is approximately £2 million. There have been difficulties and discrepancies with the monitoring of debts and the recording of income taken against actual monies banked and the number of meals served by catering. To develop and deliver a cashless solution that will provide the local authority with a more comprehensive view of catering in schools. 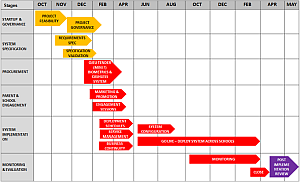 The gantt chart below highlights the stages of the programme. An integrated approach for gathering data that supports all stakeholders to access better planned and delivered services. Business case was developed and submitted to Cabinet members and achieved approval. Restructured business processes producing AS-IS and TO-BE models. The programme plan (gantt chart) was implemented. Design of a new architecture for the new IT solution. Potential on-going savings of £300k per annum.